Frank Castle. known as The Punisher. got his hands on a War Machine suit of armor and waged a one-man war against crime. He not only deals with injustice in the most permanent ways possible. he does so without fear of damage from conventional weapons. He's unstoppable. Inspired by the popular game MARVEL Future Fight. 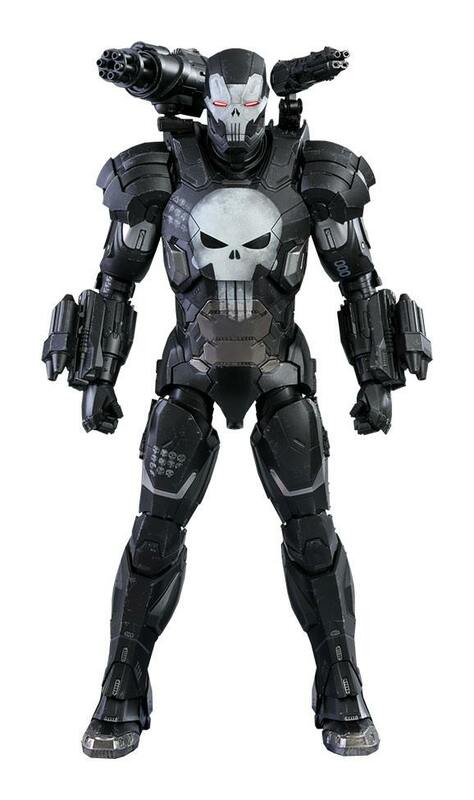 Sideshow and Hot Toys present The Punisher (War Machine Armor) Sixth Scale Collectible Figure specially made from diecast material. Standing approximately 32.5cm in height. this collectible figure is expertly crafted based on the appearance of The Punisher in the game. The Punisher Sixth Scale Collectible Figure features a newly developed head sculpt with an interchangeable LED-light up helmeted head. metallic black and silver colored armor with white skull motifs and weathering effects. a mini-shoulder gun and an articulated back-mounted shoulder cannon. This figure also features attachable thrust fire effect accessories and a specially designed figure stand! Marvel Future Fight fans. this is a must-have to add to your collection!